1. 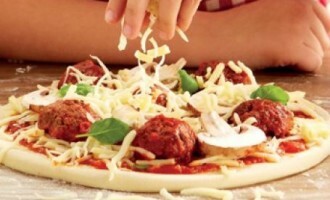 Pour 450ml lukewarm water into a large mixing bowl along with 3 tablespoons olive oil, add the pizza base mix. 2. Mix well into a soft dough, knead for 5/10 minutes, then allow to rest for 30 minutes. 3. Preheat the oven to 200°C/400°F/Gas Mark 6. 4. Lightly add olive oil and fry the meatballs until brown. 5. Slice meatballs in halves then transfer to a saucepan, pour over the pasta sauce mix and simmer, then gently stir every so often for 15 minutes. 6. Next add the pesto into the saucepan, then start slicing the chestnut mushrooms. 7. Cut the dough into 4 equal pieces and roll out thinly into approximately 30cm rounds. 8. Divide the tomato sauce and sliced mushrooms between the 4 bases, sprinkle over the grated mild and mature cheddars. 9. Put 6 halves of meatballs on each serving, and then scatter the mushrooms on top. 10. Sprinkle some oregano and black pepper. 11. Bake in the oven for 15-20 minutes, until crisp and hot.